When a stolen car is recovered on the Gulf Coast of Florida, it sets off a search for a missing woman, local motel owner Sabine Musil-Buehler. Three men are named persons of interest—her husband, her boyfriend, and the man who stole the car. Then the motel is set on fire; her boyfriend flees the county; and detectives begin digging on the beach of Anna Maria Island. Author Cutter Wood was a guest at Musil-Buehler’s motel as the search for her gained momentum. Driven by his own need to understand how a relationship could spin to pieces in such a fatal fashion, he began to talk with many of the people living on Anna Maria, and then with the detectives, and finally with the man presumed to be the murderer. But there was only so much that interviews and transcripts could reveal. In trying to understand how we treat those we love, this book, like Truman Capote’s classic In Cold Blood, tells a story that exists outside documentary evidence. Wood carries the investigation of Sabine’s murder beyond the facts of the case and into his own life, crafting a tale about the dark conflicts at the heart of every relationship. "A murder on the Gulf's Coast's Anna Maria Island sets the stage for a fascinating exploration of love and loss, told amid swaying palm trees and seedy motels." "Wood’s mixture of fact and art yields a tale both gritty and introspective, with a real murder providing an entree to an examination of the nature of love. Wood’s prose is detailed yet deft... This is a fine true-crime mystery and a touching journey into the human heart." 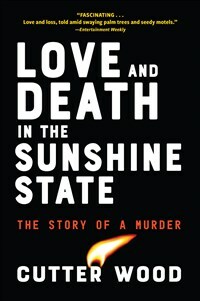 "If Elmore Leonard had narrated Michael Paterniti’s Driving Mr. Albert, the result might be something like Cutter Wood’s Love and Death in the Sunshine State: a smart, engrossing true-life noir that weaves in meditations on love and the literary life, all set amid the palm trees and seedy motels of Florida’s steaming coastline." "A striking blend of reportage, memoir, and confession, Cutter Wood has created a story that is bold, rapturous, and heartbreaking. In this extraordinary work of nonfiction, Wood considers what it means to love and be loved and reckons with the co-existence of our everyday desires in the midst of incomprehensible terror. Like the the work of Sebald, the book's unexpected paths to self-reflection and grace are wonderfully disorienting and sure to leave you rethinking the world around you." Cutter Wood completed an MFA in creative nonfiction writing at the University of Iowa. His work has appeared in Harper’s, American Short Fiction, the Paris Review, and other publications, and he has been awarded fellowships from the National Endowment for the Arts and Bread Loaf Writers' Conference. He lives in Brooklyn with his wife and daughter.